As early as it seems (and it does seem early, even though it happens at the same time every year), it's starting to get pretty Christmassy all up in here. I've already been seeing gift guides online and Christmas decor in shops, and now the city is putting on it's glad rags. 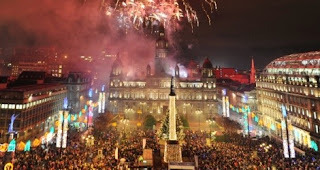 Glasgow's delightfully garish Christmas lights will be lit tonight at 5pm. Come along and see the kitsch craziness with live music, dancing, and fireworks. Tickets are required for entry. The Royal Glasgow Institute of Fine Arts (RGI) Annual Exhibition is running at the McLellan Galleries until 8 December. The exhibition, which is in its 152nd year, is the oldest annual art show in Scotland. The RGI is an independent organisation promoting and encouraging Scotland's contemporary art and artists. The Street Food Cartel will be having another festival of yumminess all weekend at SWG3, featuring diverse cuisines and artisan beer. I went to one of their previous events and the food was amazing. I would say that it will be busy, and not very stroller friendly. Tickets are £5, which includes a welcome cocktail or beer. BYOB (Bring Your Own Beamer) is a video and sound installation held at the Whiskey Bond Friday night only. BYOB is held in over 50 cities around the world, including Berlin, London, Toronto, Caracas and New York. It's a multi-projection exhibition which, according to the List, makes a 'mad melange of sound and visuals that really deserves to be seen'. Sounds good, no? Glasgow's Christmas Market opens Saturday and will be running until the 23rd of December. The market runs every year in Glasgow and offers gifts, food, drinks and plenty of Christmas atmosphere. Once open, the market will be running daily from 10:00am until 8:00pm Monday to Wednesday and until 9:00pm Thursday to Saturday. The market closes at 6:00pm on Sundays. Glasgow instrumental duo, Ubre Blanca, will be playing at the Old Hairdressers. Their song Taxed sounds like the sound track to a daylight scene from the beginning of a Dario Argento film. I'm seeing some young woman in high heels rushing down a narrow Italian street, dwarfed by ancient columns as her heels echo down a sunlight deprived alley. Or something like that. Or get some laughs at the Stand's sellout performance the Saturday Show. This Saturday's show includes Brendon Burns, Simon Donald, Susie McCabe and Gareth Mutch. I read and absolutely loved Ender's Game when I was about 14, and followed it up by reading pretty much every single Orson Scott Card book I could find. I am dying to see the new film, which is previewing this weekend, but with the baby, I never get to the cinema anymore. Go and see it and tell me how it is. I'll live vicariously through you.